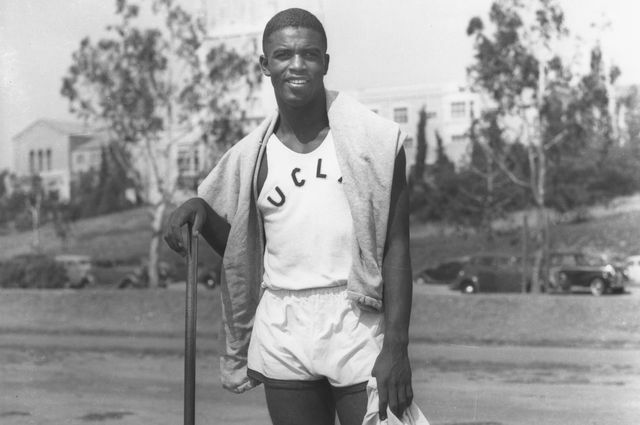 UCLA Library Special Collections, University ArchivesJackie Robinson, who lettered in four sports at UCLA, went on to a groundbreaking career as an athlete and activist. At a time when Major League Baseball was a whites-only profession, Jackie Robinson, one of UCLA’s most esteemed alumni and one of the nation’s most respected athletes and advocates, stood up and stood out. As the first African-American man to play in the league, Robinson endured racist taunts, threats to his safety and that of his family, and discrimination from fans, players and even teammates. Through his determination to excel as a player and serve as an example to others, Robinson became a star on the field and won the hearts and minds of those who desired racial equality and who looked to Robinson as a catalyst for social change. To commemorate what would have been Robinson’s 100th birthday, UCLA will be hosting a series of events to salute Robinson’s life and legacy. 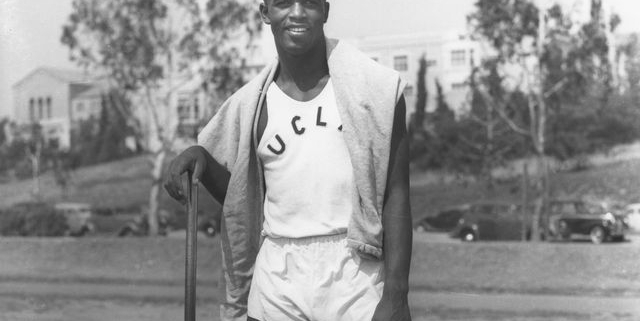 Robinson, who would have turned 100 on Jan. 31, lettered in four sports while attending UCLA from 1939 to 1941. He later served two years in the military and then became the first African-American to play major league baseball; debuting with the Brooklyn Dodgers in 1947. He was named to six all-star teams during his 10-year career and in 1962 became the first African-American to be elected to the National Baseball Hall of Fame. After retiring, Robinson, who died in 1972, served as a champion for civil rights and economic opportunity for African-Americans by joining Martin Luther King Jr. as honorary chairmen of the Youth March for Integrated Schools in 1958, writing a syndicated newspaper column about race relations, family life and politics, and helping to found the black-owned Freedom National Bank, among other things. A panel discussion highlighting athletes, social justice and activism, and the legacy of Jackie Robinson will be held Tuesday, Feb. 5. The event will feature UCLA alumna and ESPN anchor Cari Champion; former Minnesota Viking, LGBT activist and Deadspin contributor Chris Kluwe; Patricia Turner, vice provost of UCLA undergraduate education and professor of African American studies; and Kaiya McCullough, a UCLA women’s soccer player and activist. It will be held at UCLA’s Jan Popper Theater, located in the Schoenberg Music Building, beginning at 5:30 p.m. The event is at capacity, but those interested in attending can sign-up to be placed on waitlist. This will be followed by the Jackie Robinson 100th Birthday Celebration Concert, also on Feb. 5. The two-hour show, which will be held at Royce Hall beginning at 8 p.m., will feature 10-time Grammy Award-winner Arturo Sandoval, nine-time Grammy-nominee Dave Koz, and four-time World Series champion and Latin Grammy-nominee Bernie Williams, and remembrances of Jackie Robinson. Grammy Award-winning keyboardist Jeff Lorber will serve as musical director. Rachel Robinson, Jackie’s widow and a UCLA Medal recipient, and their daughter, Sharon Robinson, plan to attend. A limited number of complimentary tickets for students will be available at the Central Ticket Office at 10 a.m. on Monday, Feb. 4. “I am excited that Jack is being remembered and celebrated with this music tribute. We love Jazz and having this event take place at UCLA, our beloved alma mater, makes this truly special,” Rachel Robinson said. Los Angeles Dodgers manager and UCLA alumnus Dave Roberts, and Nicole Beharie, the actress who played Rachel Robinson in the historical sports drama “42,” will be among the guests on stage. The Robinsons, who have long been lovers of jazz, once hosted backyard concerts with Dizzy Gillespie and Dave Brubeck to raise money for the Southern Christian Leadership Conference, which was led by King. A portion of the proceeds from the Royce Hall event will support the Jackie Robinson Foundation, which provides students with college scholarships. On Saturday, Jan. 26, in recognition of Robinson’s years of service during World War II, all veterans will receive free admission to UCLA baseball’s alumni game and a complimentary hot dog lunch, courtesy of UCLA Athletics. The game, which will be held at Jackie Robinson stadium, begins at 12 p.m.
On Thurs. Jan. 31, Robinson’s birthday, the UCLA Alumni Association will host a blood drive in Ackerman Union. The event runs from 11 a.m. to 5:40 p.m. Donors are asked to schedule appointments by calling the UCLA Blood and Platelet Center at 310-825-0882, Ext. 2 and mentioning “Jackie Robinson” or “JR100, or going online and including “Jackie Robinson 100” or “JR100” in the appointment notes field. In addition, donors will receive two movie tickets and two ticket vouchers to a UCLA baseball game (each good for one free general admission ticket to any 2019 game). The UCLA Library will host an exhibition featuring Robinson and his time on campus from Feb. 1–15. “Jackie Robinson and UCLA, 1939–1941,” featuring a collection of various photographs and ephemera, will be on display on the second level of the Powell Library. In addition, on Feb. 6, UCLA Athletics will pay tribute to the legacy of Jackie Robinson by honoring his family during the men’s basketball game, which begins at 6 p.m., and offering a free Jackie Robinson poster to the first 10,000 attendees.